This website is a resource created to help people become more entrepreneurial, and to execute effectively on opportunities wherever they are – from idea launches and growing startups, to jobs in established companies, to non-profits and the public sector. Anyone can add value by entrepreneurial, in any setting! This website was created by entrepreneurs, investors and college students to give anyone from a first-time entrepreneur with only an idea and enthusiasm to an experienced business person resources, answers, and connections to help them make the most of their ideas, opportunities, and ambition. Ideas and innovation are nice, but it’s execution that actually creates value. This website draws on the collective experiences of experienced entrepreneurs, investors, and educators to make widely accessible a set of practices and principles that should give anyone a solid start on making entrepreneurial execution part of their life goals, on evaluating ideas for potential, and using the right execution tools to launch and grow successfully. Are you among the many Americans who dream of starting a business but think you don’t know how? For generations people from Dartmouth College and the Tuck School of Business have been influential entrepreneurs. From multi-million dollar technology startups, market-altering product manufacturers, to non-profits that are changing the world, almost without exception, these people were first-time entrepreneurs. Today key resources for the Dartmouth Community are found in the Tuck School of Business and the Dartmouth Entrepreneurial Network (DEN), which has helped everyone from students to faculty to alumni learn to be entrepreneurial, launch their ideas, to fund them, and to get them successfully into the marketplace. 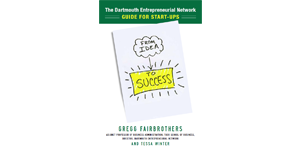 In From Idea to Success, entrepreneur, professor, and DEN founder Gregg Fairbrothers takes you step by step through the DEN approach, showing you how to apply the same principles to make your vision a reality. If you have an idea—any idea— from major technology innovations, to consumer products or services, to social enterprises, From Idea to Success shows you how to make the most of it. Buy From Idea to Success on Amazon by clicking here. Congratulations on the publication of your book. Good stuff, I can tell. I am a veteran ofthe entreprenurial environment at this point. It can be challenging and fun, frustrating and rewarding. Keep em coming; clearly our economy needs more entreprenuers.